DuMP3 is a general purpose duplicate and similar file finder. DuMP3 finds exact duplicate binaries by hash, similar text files by substring content, images (JPG, BMP, GIF, PNG, etc) by color and audio files (MP3, WAV, OGG, etc) by wave data. DuMP3 finds files by calculating a fingerprint based on the image, audio or text data for each file and then comparing the fingerprints. DuMP3 is a Java program to find any duplicate or similar file. 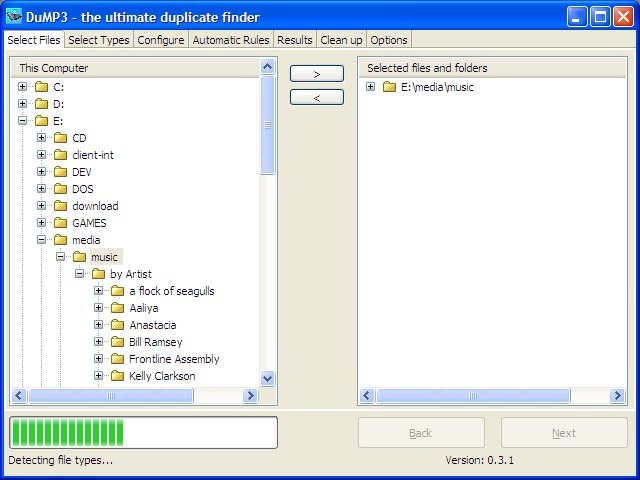 DuMP3 is a general purpose duplicate and similar file finder. DuMP3 (derived from Duplicate MP3) is a Java program to find any duplicate or similar file. DuMP3 finds files by calculating a fingerprint based on the image, audio or text data for each file and then comparing the fingerprints. DuMP3 does not compare filenames or even ID3 tags (even though plugin classes could be written that perform these operations). Calculated fingerprints can be stored in a MySQL database so that they do not have to be calculated again. As an extra bonus DuMP3 will mark the files that can not be read or decoded correctly as corrupt or with a signature mismatch. Qweas is providing links to DuMP3 0.3.2 as a courtesy, and makes no representations regarding DuMP3 or any other applications or any information related thereto. Any questions, complaints or claims regarding this application DuMP3 0.3.2 must be directed to the appropriate software vendor. You may click the publisher link of DuMP3 on the top of this page to get more details about the vendor.